Ancient Greece was a land of many city states where alliances would form, between whom war would often take place. In most cases, these city states would have a king to rule over them, and over time mythological tales would be created to explain the founding of the cities, and by what right a king ruled that city. Looking back through the historical sources, hundreds of names of Greek kings can be ascertained, although whether they were ever real or simply imagined kings, is impossible to say. Some of these kings though, are famous today, the likes of King Aeetes of Colchis, or King ﻿Minos﻿ of Crete, some like King Admetus of Pherae are less well known. Admetus was a king of Thessaly, and in particular the king of Pherae, a city founded by his father, Pheres. This means that Ametus was the nephew of Aeson, and therefore had King Pelias of Iolcus as a step-uncle. In many ancient sources, Admetus is named amongst the Argonauts, when Pelias dispatched Jason to retrieve the Golden Fleece, and it is also common to find the Thessalonian king named as one of the hunters of the Calydonian Boar. Having his name listed amongst the crew of the Argo and those who went to Calydon, should make Admetus a famous hero, but the king is better known for his hospitality and romance, than for heroic deeds. One famous act of hospitality would see Admetus play host to a god of Mount Olympus, Apollo. Apollo arrived in Thessaly having been exiled from Mount Olympus by Zeus; Apollo had killed the Cyclopes after Zeus had killed Apollo’s son Asclepius. 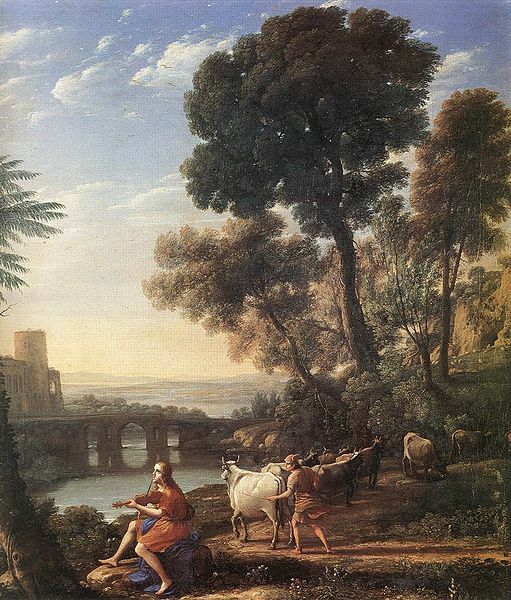 During his exile, a period of either one or nine years, Apollo was supposed to work in servitude to a mortal, and so Apollo became herdsman to Admetus. Admetus would benefit from Apollo being herdsman, as although the god was not supposed to use any of his powers, his mere presence caused each cow in the herd to give birth to twin calves. Admetus was a good and fair employer, and in gratitude for the kind treatment during his period of servitude, Apollo decided to help Admetus, when the king sought to marry Alcestis. Alcestis was the daughter of King Pelias, and the king had decided that his daughter would only marry the man who could yoke a lion and a boar to a chariot. Such a task might be impossible for most mortals, but to a god like Apollo, it was a matter of a moment before the two beasts were harnessed up. Admetus was then able to ride the chariot in front of Pelias. 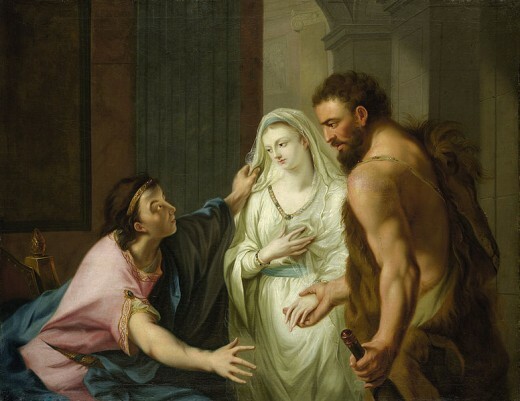 Pelias lived up to his word, and Admetus and Alcestis wed, although on their wedding night, Apollo had to come to the rescue of Admetus again. In the excitement of getting married, Admetus had forgotten to make the traditional sacrifice to Artemis, and the angered goddess, sent a nest of snakes to the bedchamber. Apollo though, interceded on the behalf of the king, and so the deadly danger was averted. Admetus and Alcestis were said to have had two children, Eumelus, who fought at Troy, and also a daughter called Perimele. Eumelus is often named as one of the Suitors of Helen, as well as one of those who would hide within the Wooden Horse at Troy. Apollo also interceded on the behalf of Admetus with the ﻿Moerae﻿ (the Fates), and having got the three sisters drunk, struck a bargain that Admetus would be released from death if another person willingly decided to die in his place. Eventually, the time came for Admetus to die, and the king of Thessaly thought that one of his elderly parents would willingly die in his place. Neither though was willing to make the sacrifice, and nor could Admetus find anyone else to take his place, but then Alcestis offered to die in the place of her husband. Admetus was alive, but now the king regretted it, as he had lost the love of his life. At this point, the hero Heracles arrived in Thessaly, and heard about the plight of Admetus. Admetus had been a hospitable host to Heracles, when the hero was undertaking his labour to deal with the Mares of Diomedes. 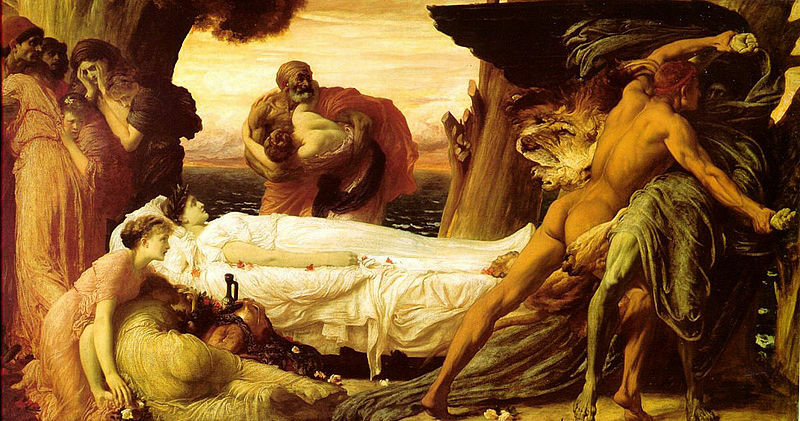 In recognition of the kindness received, Heracles decided to enter the tomb of Alcestis, where he encountered Thanatos (Death). Heracles wrestled with Thanatos until the god succumbed to the hero’s strength, at which point, Thanatos agreed to release Alcestis, allowing her to return to her husband’s side. The story of Admetus effectively ends at this point, as this is where Alcestis (c438BC), the Euripdes play ends, and there is no further mention of the Thessalonian king.